What was the first civilization in Europe? What European country had the first palace? The answers to those questions are (1) Crete and (2) Crete at Knossos. A prediction: The role of Crete in the Libyan war will cause her reappearance in the news in the coming months. A French C160 Transall taxis as a Greek F16 fighter takes off at the Souda military base, on the Greek island of Crete. Greece has no direct involvement in the air and missile attacks on Libya that began on the Saturday after the UN resolution of March 17, 2011. Still it has sent a navy frigate to the region and has offered the use of its air bases to the countries involved. The United States has also used a navy base on the island to build up Libya-bound forces. 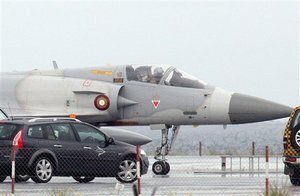 A Qatar Emiri Air Force Dassault Mirage 2000-5EDA fighter jet prepares for takeoff from Larnaca international airport, Cyprus, Tuesday, March 22, 2011. Two Qatar Air Force fighter jets and a C-17 Globemaster cargo aircraft were heading to Crete in the first sign of military operations by Qatar so far to help enforce a no-fly zone over Libya, officials said. 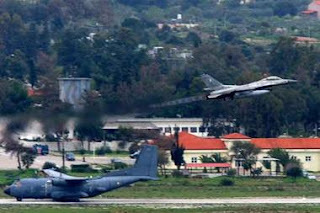 The planes made an unscheduled stop at the island's Larnaca airport, and government spokesman Stefanos Stefanou said in a statement that the aircraft would depart after refueling. Crete is a location not to be underestimated in history, especially ancient history. Look for more news from Crete in the near future. Crete (Greek: Κρήτη) is the largest and most populous of the Greek islands and the fifth largest island in the Mediterranean Sea. It forms a significant part of the economy and cultural heritage of Greece; while it retains its own local cultural traits (such as its own dialect, poetry, and music). 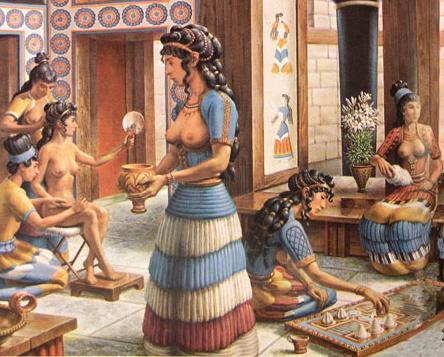 Crete was the center of the Minoan civilization (circa 2700–1420 BC). Under Roman rule, in Classical Latin, the island was called Creta. 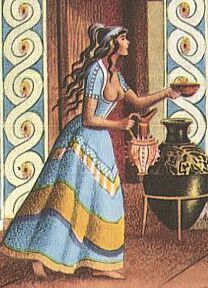 Under Venetian rule, it was known as Candia (sometimes anglicized as 'Candy'), a Venetian adaptation of the earlier Greek name Chandax (Greek: Χάνδαξ, "moat") or Chandakas (Greek: Χάνδακας), which in turn came from the Arabic rabḍ al-ḫandaq 'castle of the moat'. Under Ottoman rule, in Turkish, it was called Girit. 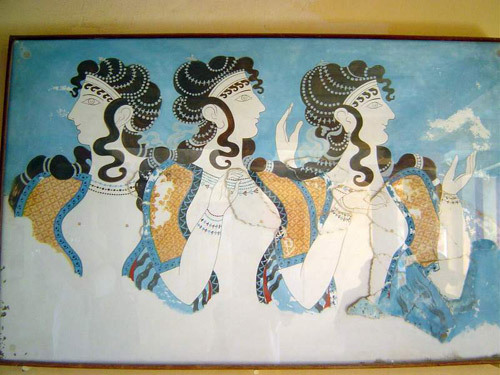 Crete has a rich mythology mostly connected with the ancient Greek Gods but also connected with the Minoan civilization. The Idaion cave at Mount Ida was the birthplace of the god Zeus. The Paximadia islands were the birthplace of the goddess Artemis and the god Apollo. 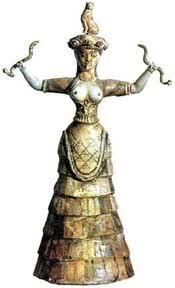 Their mother, the goddess Leto, was worshipped at Phaistos. The goddess Athena bathed in Lake Voulismeni. The ancient Greek god Zeus launched a lightning bolt at a giant lizard that was threatening Crete. The lizard immediately turned to stone and became the island of Dia. The island can be seen from Knossos and it has the shape of a giant lizard. The islets of Lefkai were the result of a musical contest between the Sirens and the Muses. 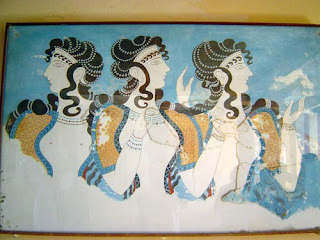 The Muses were so anguished to have lost that they plucked the feathers from the wings of their rivals; the Sirens turned white and fell into the sea at Aptera ("featherless") where they formed the islands in the bay that were called Lefkai (the islands of Souda andLeon). Hercules, in one of his labors, took the Cretan bull to the Peloponnese. 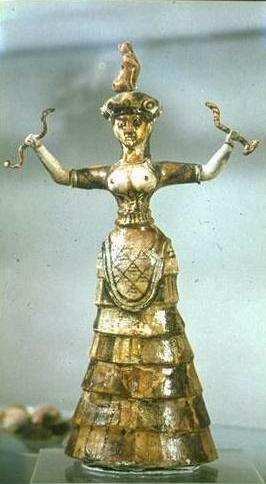 Europa and Zeus made love at Gortys and conceived the Kings of the Minoan civilization. The labyrinth of the palace of Knossos has the myth of Theseus and the Minotaur where the Minotaur was slayed by Theseus. Icarus and Daedalus were captives of King Minos and crafted wings to escape. King Minos became a judge of the dead in Hades. The Minoan eruption of Thera devastated the Minoan civilization. 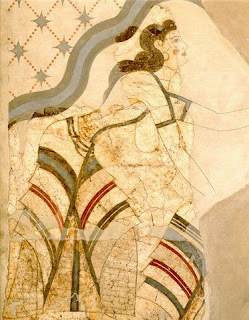 Wall paintings in Crete, the center of the Minoan civilization, show what has been described as a bikini, apparently a woman performing in athletics. Similar depictions have been found in Sicily (Villa Romana del Casale, 4th Century). However, Minoan women on the island of Crete 3,000 years ago wore garments that partially supported yet revealed their bare breasts; the best known example of this style is the Snake Goddess. They used corsets that were fitted and laced, or a smaller corselette that left the breasts exposed or even forced them upwards to make them more visible. However, this corset was outerwear, not underwear. 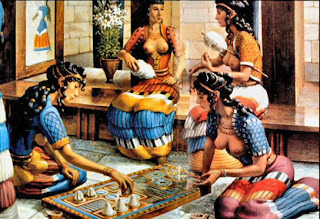 Covering the breasts, or even wearing a bra-like garment, was not a usual part of Minoan life. The succeeding Mycenaean civilization also emphasized the breast, which had a special cultural and religious significance. Indiana state police are reporting that a person has been shot at a middle school in central Indiana and the 15-year-old shooter is in custody. Sgt. 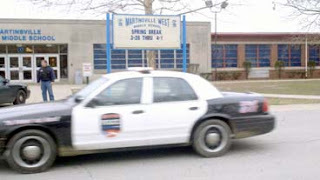 Kirk Durnil says the male victim (15 year old Chance Jackson) was shot twice in the stomach Friday morning, March 25, 2011, at West Middle School in Martinsville, Indiana. Durnil did not identify the shooter or the victim at the school, some 30 miles south of Indianapolis. WRTV notes the shooter is a recently expelled student. 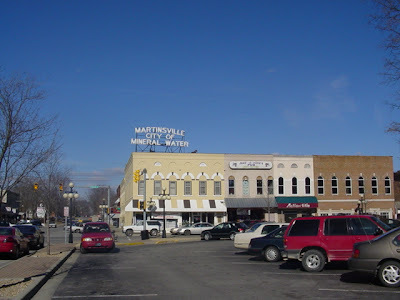 Martinsville is a city in and the county seat of Morgan County, Indiana, United States; the population was 11,828 at the 2010 census. Once dubbed the “Goldfish Capital of the World,” today Martinsville has several large fisheries that sell fish to many parts of the world. 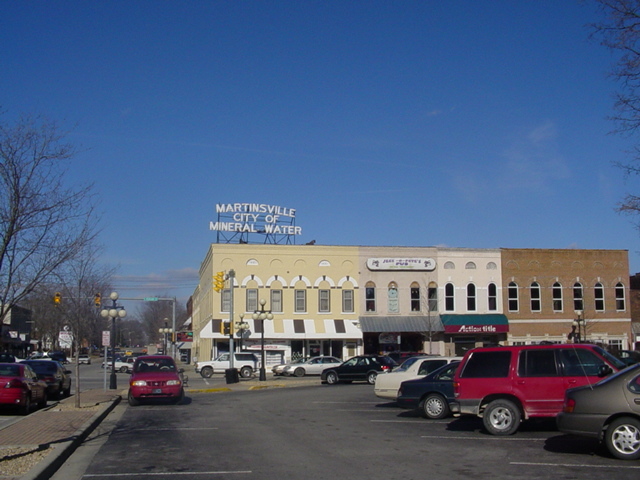 From 1888 until 1968 visitors sought out the many artesian mineral water heath spas (called sanitariums then) of Martinsville for health benefits. Over the course of nearly 100 years, almost a dozen sanitariums were in operation for various periods of time, including the first black spa in Martinsville. Albert Merritt (1871–1958), founder of the Boy's Club in Martinsville, born near Bowling Green, was the son of former slaves. He came to Martinsville Mineral Springs Sanitarium in the 1890s from a job as a porter at the Sennings Hotel in Louisville, and lived at the sanitarium for the rest of his life, never marrying. He worked with the children of Martinsville for fifty years, building a clubhouse on North Marion Street. Merritt Park on the northwest end of town is named for Albert. Visitors would travel by rail and road to bathe and refresh in the mineral springs and waters. Many luminaries visited Martinsville in the early 20th century to enjoy the mineral waters and spas for their perceived therapeutic and health restoring qualities. On top of what used to be the National Sanitarium a refurbished neon sign still displays "Martinsville City of Mineral Water " as it did so many years ago. Today's date is the birthday of John A. Keel, an author and demonologist who wrote The Mothman Prophecies. The nonfiction book is about the banshee-like appearance of a weird winged creature in 1966-1967, around Point Pleasant, West Virginia, which was seen as a precursor to the collapse of the Silver Bridge on December 15, 1967. A total of 46 people died when the bridge fell into the Ohio River. On March 25, 1989, a postal worker Donald Mace, at a post office in Poway, California, died by suicide. On March 24, 1998, the Westside Middle School massacre was a school shooting at the Westside Middle School in unincorporated Craighead County, Arkansas, United States, near Jonesboro. A total of five people, four female students and a teacher, were killed. 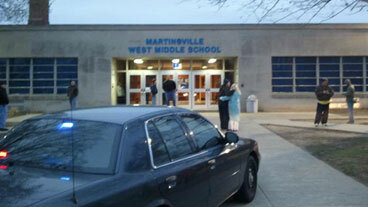 Ten people, nine students and one teacher, were injured. The perpetrators of the shooting were two students, 13-year-old Mitchell Johnson, and 11-year-old Andrew Golden, who were shooting in an ambush style from the woods in camouflaged clothes. Police have recovered the bodies of one of two suspected murdered individuals near the famed White Horse of Uffington. The Uffington White Horse is a highly stylised prehistoric hill figure, 374 feet (110 m) long, formed from deep trenches filled with crushed whitechalk. 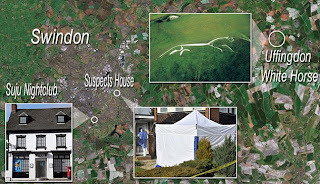 The figure is situated on the upper slopes of White Horse Hill in the English civil parish of Uffington (in the county of Oxfordshire, historically Berkshire), some five miles south of the town of Faringdon and a similar distance west of the town of Wantage. The Daily Mail, among other sources, is reporting that police hunting for the missing Sian O'Callaghan (pictured above) said they have found the body of the 22-year-old buried at this famous beauty spot. The area is symbolic* and historically significant. 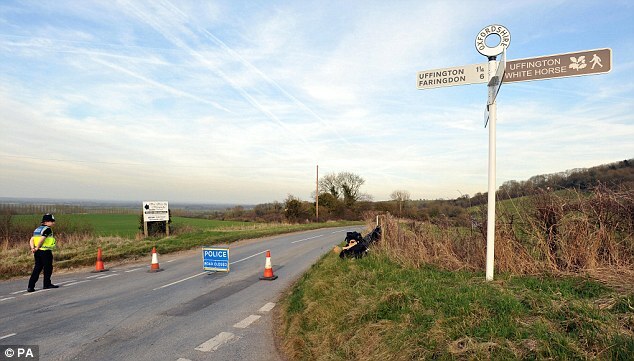 The body was found near the White Horse of Uffington hill, near Wantage, Oxfordshire, around 13 miles from the nightclub where she disappeared from last Saturday evening. Detective Superintendent Steve Fulcher said a 47-year-old cabbie from Swindon was being held on suspicion of the murder. Police search the area for evidence. The divorced father-of-three is said to have told the police the location of a second body but further details have not yet emerged. Although formal identification of the body found today is yet to take place, he said the bodies is believed to be missing Sian and her family had been informed. Police earlier swooped on a man at an Asda store in Swindon - and arrested him before seizing a vehicle. The man arrested today was named by neighbours as local private hire driver Chris Halliwell. 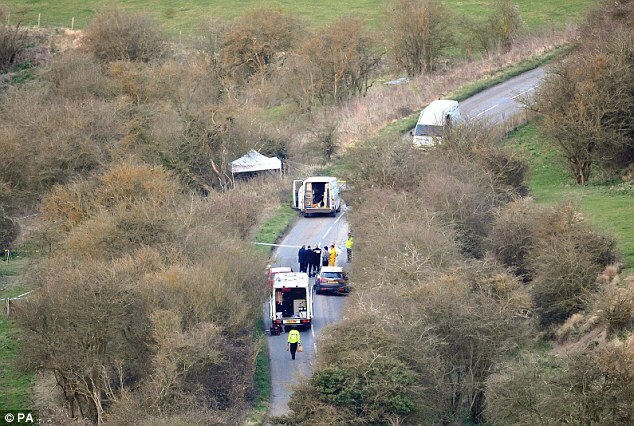 The divorced father-of-three teenage girls lived around 11 miles, or a 25 minute drive, from the 'shallow grave' that Sian's body was found in close to the beauty spot. He is reported to have spoken with police today then walked them to the bodies at the landmark. 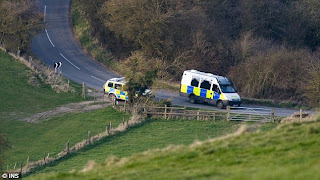 Police had previously said that two bodies had been found but it is now understood that only one has been discovered. The location of a second body believed to be buried nearby was made known to police but they have not yet discovered it. At a press conference tonight Mr Fulcher from Wiltshire Police said: 'A 47-year-old man from Swindon is in custody, having been arrested for kidnap and two murders. 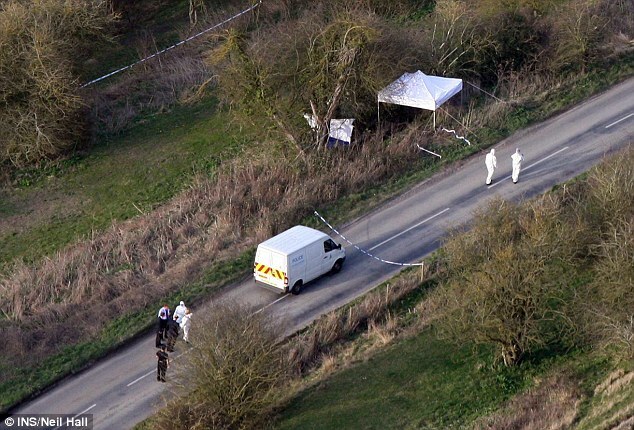 'The location of two bodies have been identified to me by this individual, one of whom has yet to be identified formally, but I am quite clear is Sian. 'I have informed Sian's family, who are obviously deeply distressed, and I would ask you please to give them time and space to come to terms with what's happened. 'The public and the media have been a fantastic help in the desperate effort to find Sian over the last few days. This has of course been a fast-paced inquiry. He said he was concerned for the family, and the effect this would have on them. 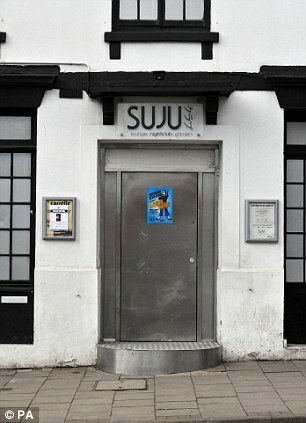 Police had earlier been combing woodland with sniffer dogs as they searched for Sian who had not been seen since Saturday evening at the Japanese-themed Suju nightclub. 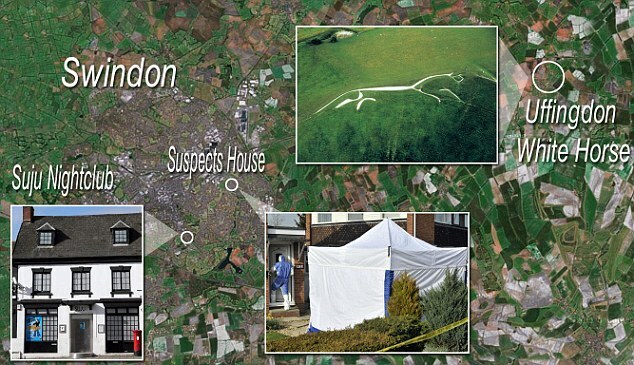 But a white forensics tent had today been set up on a gravel driveway outside the suspect's semi-detached red-brick home in Swindon and it was cordoned off as forensic officers examined the scene. A neighbour, who did not want to be named, said the father-of-three was divorced and had been separated from his wife. 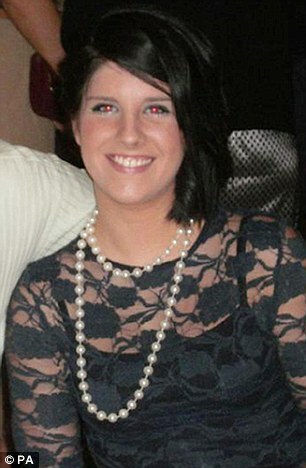 Sian went missing after a 'girl's night out' with friends at a nightclub in her home town. She was pictured on CCTV leaving the club in the High Street at 2.52am. The flat she shared with her boyfriend, Kevin Reape, 25, is just a half-a-mile walk away from the night spot but she did not make it home. Mr Reape contacted police the next morning after failing to get in touch with his partner. The Japanese-themed Suju nightclub is in Swindon, Wiltshire; it was where Sian was last sighted before she was apparently taken to the woodlands. The hill forms a part of the scarp of the Berkshire Downs and overlooks the Vale of White Horse to the north. 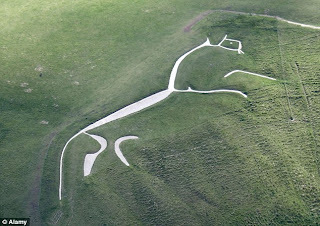 Best views of the White Horse figure are obtained from the air, or from directly across the Vale, particularly around the villages of Great Coxwell, Longcot and Fernham. The site is owned and managed by the National Trust. The figure has been shown to date back some 3,000 years, to the Bronze Age, by means of optically stimulated luminescence dating carried out following archaeological investigations in 1994. These studies produced three dates ranging between 1400 and 600 BC. Iron Age coins that bear a representation comparable to the Uffington White Horse have been found, supporting the early dating of this artifact; counter suggestions that the figure was fashioned in the Anglo-Saxon period now seem untenable. Numerous other prominent prehistoric sites are located nearby, notably Wayland's Smithy, a long barrow less than two kilometres to the west. The Uffington is by far the oldest of the white horse figures in Britain, and is of an entirely different design from the others. It has long been debated whether the chalk figure was intended to represent a horse or some other animal. However, it has been called a horse since the eleventh century at least. A cartulary of Abingdon Abbey, compiled between 1072 and 1084, refers to "mons albi equi" at Uffington ("the White Horse Hill"). The horse is thought to represent a tribal symbol perhaps connected with the builders of Uffington Castle. It is quite similar to horses depicted on pre-Roman British coinage and the Marlborough bucket. Until the late 19th century the horse was scoured every seven years as part of a more general local fair held on the hill. When regular cleaning is halted the figure quickly becomes obscured; it has always needed frequent work for the figure to remain visible. In August 2002 the figure was defaced with the addition of a rider and three dogs by members of the "Real Countryside Alliance" (Real CA). The act was denounced by theCountryside Alliance. The white horse at Folkestone, Kent, is based on this horse. At Ciudad Juárez, Mexico, there is a larger replica of the Uffington horse. *For those interested in the general Fortean thoughts of how some unexplained events appear to be linked to "devil names" and other similar sites, please see past entries in the archives of this blog and this passage from my book, Mysterious America. As those who are aware of my nearly 40 years of human services and forensic work with abused children and adults realize, I do not take it lightly such criminal activity. In understanding the underlying themes of symbolism, it is hoped that future killings, injuries, and harm will be prevented to the victims of such incidents. Sources: As noted, the mainstream media has covered this story extensively in the U.K. The White Horse of Uffington material is from Wikipedia, for general background. 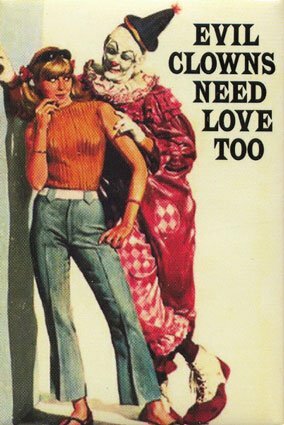 What is the source of this poster's twisted concept? Trying to find the "Top Ten Evil Clowns of 2011"? See here. 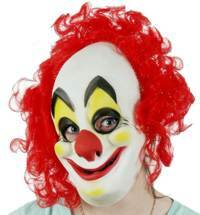 A man has been assaulted by two men wearing clown masks in Donaghadee, a small town (population about 6,500) in County Down, Northern Ireland. The town lies on the northeast coast of the Ards Peninsula, about 18 miles (29 km) east of Belfast and about six miles (10 km) south east of Bangor. At about 8 PM local time (2000 GMT) on Tuesday, 22 March 2011 (i.e. 22-3-11 in the UK), two men with baseball bats called to a flat in Barnagh Grove and assaulted the 42-year-old who lives there. The man's arm was broken and he suffered other injuries. He was taken to a hospital for treatment, according to the BBC. Police said the attackers were wearing "clown-type masks" and black clothing. Donaghadee is known as a significant site from the Irish Rebellion of 1798. On the morning of Pike Sunday, June 10, 1798, a force of United Irishmen (a guerilla force, not unlike the revolutionaries contemporary in America and France), mainly from Bangor, Donaghadee, Greyabbey and Ballywalter, Ireland, attempted to occupy the town of Newtownards. They met with musket fire from the market house and were defeated. A question for the Irish readers: What is "Pike Sunday"? March 17th: War In Libya?